Drive to Hamadan via Qazvin to visit Friday Mosque in Qazvin, afternoon sightseeing in Hamadan, we will visit one of the unique phenomena in the world, Ali sadr Cave, which is one of the biggest water caves. O/N Hamadan. Drive to Masooleh en route visit Rudbaad Manjil Dam, O/N Masooleh. This day tour you will visit the historical village of Masooleh. Its architecture is one of the inquests in the world which is registered in UNESCO. Masooleh architecture is unique. The buildings have been built into the mountain and are interconnected. Drive to Anzali O/N Anzali. Drive to Minoodasht en route visit Ramsar O/N Minoodasht. Drive to mashhad en route visit the historical city of Neishabour and visit the tombs of Hakim Omar Khayyam, Attar, Kamal-ol-Molk and Mahrough Shrine, O/N Mashhad. Full day city tour including Archaeological Islamic Art Museums, the finest museum in Mashhad, O/N Mashhad. Drive from Mashhad to Tabas en route visit gunabad, firdous, and the famous warm water springs, O/N Tabas. Drive from Tabas to Garmeh en route visit Mesr village, there we can do Camel Riding in the desert (Sand dune) then drive for Garmeh, O/N Garmeh. Drive from Garmeh to Yazd en route visit Kharanagh village, Caravan Sarai, Shaking minaret, O/N Yazd. Today we have a full day city tour of Yazd visiting the Alexander prison, 12 Imam tomb, old city Friday mosque, Seyed-e-Roknadin, Amir Chakhmagh Mosque and theater, and wind trappers, Water museum the oldest burning fire in Iran at the Zoroastrian Fire temple and the Tower of silence. O/N Yazd. Drive to Kerman en route visit Caravan sarai Zainodin in the middle of the desert, O/N Kerman. Full day city tour visiting The Ganj Ali Khan complex including Bath & Bazaar as well as the visit Jame Mosque, & also visit Mausoleum of Shah Nematollah e Valli and the lovely Shahzadeh (Prince) Garden in Mahan. O/N Kerman. We drive toward Shiraz from Kerman. en route visit a Sasanian Palace (5th AD) in Sarvestan, Jameh Mosque of Neyriz, a short stop near the salt lake to catch a view of its beautiful nature, O/N Shiraz. The city of Nightingales and Flowers, Visit Jam-e Atiq Mosque, Karim Khan Zand Palace, Vakil Complex,(Vakil Mosque, Vakil Hamam, Vakil Bazaar) Pars Museum, The Tomb of Hafez, Koran Gate, In the evening visit marvel at mirror decoration of Ali ebne hamze Holy Shrine, O/N Shiraz. This morning we leave Shiraz for Bavanat and will en-route visit the most magnificent city of the ancient world, Persepolis, We continue our trip by visiting Naghsh-e-Rostam, & Naghsh-e-Rajab, the Archaemenian royal necropolis and Pasargadae the tomb of Cyrus the great. O/N Bavanat. visit Bavanat in the heart of the Zagrus Mountain, enjoy being with the nomads, their daily life and traditions, Drive to Esfahan .O/N Esfahan. Full day city tour of Imam Square, a jewel of Persian architecture which includes the Ali Qapou Palace, Imam & Sheikh Lutfullah mosques, Chel Sooton palace Handicraft factories and Esfahan bazaar with its traditional arcades. In the evening we visit the most beautiful and famous Zayandeh Rud river. O/N Esfahan. In the morning drive to Abyaneh, there you will visit the UNESCO recognized village of Abyaneh, located at the foot of Mount Karkas and in the vicinity of desert. Appreciate the serenity of this quaint village with its splendid archaeology and meet the dwellers who speak, live and dress in the original Persian style. O/N Abyaneh. Drive to Kashan, City tour in Kashan Visit the Hostorical houses of Brugerde, Ameereyah, Tabatabae, Sultan Ahmed Khan Hamam, Fin Garden, O/N Kashan. Move from Kashan to Tehran international airport (IKA) for your return flight. Drive to Tabriz and visit the impressive tomb of Shahriar, the great Iranian poet. you will also visit the exotic bazaar with an interesting array of ethnic crafts on sale, see the exquisite Jameh and Kabood Mosques and explore the interesting collections of the Azerbaijan and Constitution Revolution Museums. O/N Tabriz. You will visit village of Kandovan and be amazed by its unique and picturesque architecture. Kandovan is located in the westward of Tabriz. After passing the city of Oskoo and beautiful mountainous scenery we will reach this marvelous village. The archeologists have estimated the antiquity of this village to 3000 years ago. O/N Tabriz. Drive to Ardabil to visit the mausoleum of Sheikh Safi-ad-Din-e-Ardabili. It is an impressive ancient monument, comprising the following components: the mausoleums of Sheikh Safi and Shah Isma’il, Chini khaneh (meaning the house of chinaware), a mosque, Jannat Sara (meaning the house of paradise), Khanaqah (the house of Dervishes), Cheragh Khaneh (the house of lamps), Shaheed khaneh (the house of martyrs) and Chelleh Khaneh (the place where devotees shut themselves for forty days of Lent). The mausoleum of Sheikh Safi, the famous dome of which is called “Allah-Allah” has an octagonal interior. Near Ardabil (25 KM) is the city of Sarein which is well-known for its spas. There you can enjoy the remedial benefits of those spas. O/N Sarein. This day tour you will visit the historical village of Masooleh. Its architecture is one of the inquests in the world which is registered in UNESCO. Masooleh architecture is unique. The buildings have been built into the mountain and are interconnected. Courtyards and roofs both serve as pedestrian areas similar to streets. Masooleh does not allow any motor vehicles to enter, due to its unique layout. It is the only village in Iran with such a prohibition. However, the small streets and many stairs simply also wouldn’t make it possible for vehicles to enter. Yellow clay coats the exterior of most buildings in Masooleh. O/N Masooleh. Drive westward to Kermanshah. In an old town called Kangavar you will visit the Anahita Temple-the mother goddess of abundance and guardian of water in ancient Persia. Carry on the old caravan route to Bistoon dating back to the Middle Paleolithic, visit the tomb of Ostad Khalil Alinejad the best player of Tanboor in the world, & also visit the Sassanian rock carvings of Tagh-e-Bostan. These bas-reliefs, cut from the stone cliff, depict royal scenes of battles and hunts reflecting the glorious history of the Sassanid Kings. O/N Hamadan. Hamadan is believed to be amongst the oldest Iranian cities and one of the oldest in the world. Hamadan is a green mountainous area on the foothills of the 3574-meter Alvand Mountain, in the mid west of Iran. The city is 1850 meters above sea level, visit the mausoleums of the philosopher/mathematician Ibn Sina (Avicenna), and Baba Taher. the shrine of Esther & Mordecai, the most important Jewish pilgrimage site in Iran. A Jewish presence in Hamadan remains today. O/N Hamadan. Drive from Hamadan to Kashan and visit Tabatabaiha and Borojerdiha house and some other historical places specially chosen by your tour guide and be acquainted with the previous century’s architecture, the Qajar era. O/N Kashan. Drive to Abyaneh visit the UNESCO recognized village of Abyaneh, located at the foot of Mount Karkas and in the vicinity of desert. Appreciate the serenity of this quaint village with its splendid archaeology and meet the dwellers who speak, live and dress in the original Persian style. O/N Abyaheh. Drive from Abyaneh to Garmeh en route visit Mesr village, there we can do Camel Riding in the desert (Sand dune) then Drive for Garmeh. O/N Garmeh. Drive from Garmeh to Yazd en route visit Kharanakh village, Caravan Sarai, Shaking minaret, O/N Yazd. Move from Yazd to Chack Chack, visit the holy Chack Chack, then Meybod, where you visit Narain castle,(the oldest mud brick castle in Iran) Caravansarai “Shah Abbasi” Zeloo Museum, Ice-house, Handicrafts showroom, Pigeon House, and back to Yazd, O/N Yazd. Today we have a full day city tour of Yazd visiting the Alexander prison, 12 Imam tomb, old city, Friday mosque, Seyed-e-Roknadin Amir Chakhmagh Mosque and theater, wind trappers, Water museum, the oldest burning fire in Iran at the Zoroastrian Fire temple, Tower of Silence O/N Yazd. Drive to Shiraz en route visit Aghazadeh house, 4500 years old cypress tree and Gobaad Alli in Abarkhuh, move to visit Pasargade, the Archaemenian royal necropolis, the tomb of Cyrus the great, Naqsh-e-Rustam; Naqsh-e-Rajab. O/N Shiraz. The city of Nightingales and Flowers, Visit Jam-e-Atiq Mosque, Karim Khan Zand Palace, Vakil Complex,(Vakil Mosque, Vakil Hamam, Vakil Bazaar) Pars Museum, The Tomb of Hafez, Koran Gate, In the evening visit marvel at mirror decoration of Ali ebne hamze Holy Shrine. O/N Shiraz. This morning we leave Shiraz for Esfahan and will visit en-route the most magnificent city of the ancient world, Persepolis, which is registered as a UNESCO world heritage site. Persepolis was the ceremonial capital of the Persian Empire during Archemaenian era. O/N Esfahan. Full day city tour of Imam Square, a jewel of Persian architecture which includes the Ali Qapou Palace, Imam & Sheikh Lutfullah mosques, Chel sutoon Palace, Handicraft factories, Hasht Besht Palace and bazaar with its traditional arcades. O/N Esfahan. Dive to Tehran international airport (IKA) for your return flight. Drive to Hamadan via Qazvin to visit Friday Mosque in Qazvin, afternoon sightseeing in Hamadan. In the evening you will visit one of the unique phenomena in the world, Ali sadr Cave, which is one of the biggest water caves. O/N Hamadan. Drive westward to Kermanshah. Carry on the old caravan route to Bistoon dating back to the Middle Paleolithic. You will visit the Anahita Temple-the mother goddess of abundance and guardian of water in ancient Persia. Nearby in the village of Sahneh you can visit the tomb of Ostad Khalil Alinejad the best player of Tanboor in the world.In Kermanshah visit the Sassanian rock carvings of Tagh-e-Bostan. These bas-reliefs, cut from the stone cliff, depict royal scenes of battles and hunts reflecting the glorious history of the Sassanid Kings. O/N Kermanshah. Drive from Kermanshah to Ahwaz en route visit, remnants and the historical relics of Susa are testament to the fact that this city was established 7000 years before Christ, Then visit the exquisite beauty of the Apadana palace and the historical castle of Susa.O/N Ahwaz..
Today we visit to the magnificent Chogha Zanbil temple. It is one of the few extant ziggurats outside of Mesopotamia (the other is Sialk). Archaeological excavations undertaken between 1951 and 1962 revealed the site again, and the ziggurat is considered to be the best preserved example in the world. In 1979, Choqa Zanbil became the first Iranian site to be inscribed on the UNESCO World Heritage list. Then, visit the charming Shooshtar waterfalls and historical bridges. O/N Ahwaz. Depart Ahwaz for Shiraz where you can delight yourself in many of the beauties in this city. You will visit the historical relics of Sarab-e-Bahram, Bishapoor, Chogan strait Bishapoor is an ancient city situated south of modern Faliyan, on the ancient road between Persis and Elam. Ctesiphon. Bishapoor was built near a river crossing and at the same site there is also a fort with rock-cut reservoirs and a river valley with six Sassanid rock relieves. O/N Shiraz. In the morning we visit the most magnificent city of the ancient world, Persepolis, which is registered as a UNESCO world heritage site. Visit Jam-e Atiq Mosque, Karim Khan Zand Palace, Vakil Complex, (Vakil Mosque, Vakil Hamam, Vakil Bazaar) Pars Museum, The Tomb of Hafez and Koran Gate. O/N Shiraz. Drive from shiraz to Kerman en route, a short stop near the salt lake to catch a view of its beautiful nature, then visit Jameh Mosque of Neyriz, O/N Kerman. City tour Mausoleum of shah Nematollah e Vali and the lovely Shahzadeh (Prince) Garden in Mahan. visiting The Ganj Ali Khan complex including Bath & Bazaar as well as the visit of Jame Mosque. O/N Kerman. Drive from Kerman to Yazd en route visit Caravan sarai Zainodin in the middle of the desert, and Tower of Silence in Yazd. O/N Yazd. Today we have a full day city tour of Yazd visiting the Alexander prison, 12 Imam tomb, old city, Friday mosque, Seyed-e-Roknadin, Amir Chakhmagh Mosque and theater, and wind trappers, Water museum, the oldest burning fire in Iran at the Zoroastrian Fire temple, O/N Yazd. Move from Yazd to Kharanakh, Visit Kharanakh village, Caravan Sarai, Shaking minaret, Old Village. Move to Bayazeh visit the small village of Bayazeh From there pass through Aroosan village and then Garmeh After lunch visit the village O/N Garmeh. After breakfast move to Sahara-e-Mesr there we can do Camel Riding in the desert (Sand dune) then Drive for Esfahan en route visit Nain Friday mosque Cultural Museum, Continue to Esfahan O/N Esfahan. Full day city tour of Imam Square, a jewel of Persian architecture which includes the Ali Qapou Palace, Imam & Sheikh Lutfullah mosques, Handicraft factories and Esfahan bazaar with its traditional arcades. 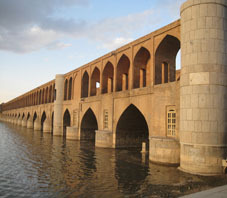 In the evening we visit the most beautiful and famous Zayandeh Rud river. O/N Esfahan. In the morning Drive to Abyaneh, there you will visit the UNESCO recognized village of Abyaneh, located at the foot of Mount Karkas and in the vicinity of desert. Appreciate the serenity of this quaint village with its splendid archaeology and meet the dwellers who speak, live and dress in the original Persian style.Drive to Kashan, city tour in Kashan visit the Hostorical houses of Brugerde, Ameereyah, Tabatabae, Sultan Ahmed Khan Hamam, Fin Garden, O/N Kashan. 28 Days: Tehran-Gazorkhan-Masooleh-Bandar Anzali-Ardabil- Sarein- Kaleybar- Julfa -Tabriz-Kandovan-Zanjan-Hamadan-Kermanshah-Khorramabad-Susa-Shushtar-Masjid e Soleman-Shiraz- Yazd- Garmeh-Esfahan- Abyaneh- Kashan-Tehran. Drive to Ghazvin Alamut Valley- en route visiting Lammasar castle-visit the Evan lake. Transfer to Gazorkhan-visiting Alamut Gazorkhan. O/N Gazorkhan. Today we visit Apadana palace and the historical castle of Susa. Fill your imagination with wonder with a visit to the first Iranian site to be inscribed on the UNESCO World Heritage List, then drive to Shushtar en route visit chogha Zanbil, Anahita Temple, visit the historical town Shushtar, where Historical Hydraulic System, inscribed as a masterpiece of creative genius, can be traced back to Darius the Great in the 5th century B.C. . O/N Masjid e Soleman. In the morning after breakfast drive from Masjid e Soleman to Shiraz, pass through Hasft Gol, Ramhormus, Behbahan, Dogonbadan, Noorabad, Quaemia, O/N Shiraz. (Niayesh Boutique Hotel). Full Day Sightseeing of Shiraz: The city of Nightingales and Flowers, Visit Arg e Karim Khan Zand Palace, Pars Museum, Vakil Complex,(Vakil Mosque, Vakil Hamam, Vakil Bazaar), The Tomb of Hafez, and the Darvazeh Quran, and visit marvel at mirror decoration of Ali ebne Hamze Holy Shrine, O/N Shiraz. This morning we leave Shiraz for Yazd and will visit en route the most magnificent city of the ancient world, Persepolis, which is registered as a UNESCO world heritage site. Persepolis was the ceremonial capital of the Persian Empire during Achemaenian era. The site, 125,000 sq. m. in area is composed of various reception halls and palaces, private palaces, royal treasury and fortifications. where we find the tomb of Cyrus the great and remains of Achaemenian palaces and edifices. We continue our trip by visiting Naghsh-e-Rostam, the Achaemenian royal necropolis and Pasargadae where we find the tomb of Cyrus the great and remains of Achaemenian palaces and edifices. Continue the tour to Abarkuh, visit 4000 old Cypress tree, drive to Yazd, O/N Yazd. Today we visit the Holy Fire Temple of the Zoroastrian which is the most important temple for Zoroastrian in the world named Peer e Sabs Chack Chack, then Meybod, where you visit Narain castle,(the oldest mud brick castle in Iran) Caravansarai “Shah Abbasi” Zeloo Museum, Ice-house, Handicrafts showroom, Pigeon House, and back to Yazd, O/N Yazd. Full day city tour visiting Alexender prison, Laryha house, 12 Imam tomb, old city streets, Jame mosque, Seyed Roknadin, Water Museum, Amirchamaq complex, Hamam-e-khan old Bazar Fire Temple, Tower of Silence O/N Yazd. After breakfast move to Sahara-e-Mesr there we can do Camel Riding in the desert (Sand dune) then drive for Esfahan en route visit Nain Friday Mosque, Desert Cultural Museum, Continue to Esfahan O/N Esfahan. Full Day Sightseeing of Esfahan: Hasht Behest Palace, Julfa Vank Church, Imam Square including Imam Mosque, Ali Qappu palace, Shaik Lutfullah mosque, old Bazaar, Chel Sotoon Palace, Famous Bridges over Zayandeh Rood, O/N Esfahan. After breakfast Drive to Abyaneh, Today you will visit the UNESCO recognized village of Abyaneh, located at the foot of Mount Karkas and in the vicinity of desert. Appreciate the serenity of this quaint village with its splendid archaeology and meet the dwellers who speak, live and dress in the original Persian style. O/N Abyaneh. Drive to Kashan and half day tour in Kashan. Visit the Hostorical houses, Brugerde house, Ameereyah house, Tabatabae house, Fin Garden, O/N Kashan. In the morning drive from Kashan Qom visit Qom, continue to Tehran international airport (IKA) for your return flight. (Depends on your departure time). 23 Days: Tehran-Gazorkhan-Masooleh-Bandar Anzali-Ardabil- Sarein- Kaleybar- Julfa -Tabriz-Kandovan-Zanjan-Hamadan- Isfahan- Shiraz- Isfahan- Kashan-Tehran. 2nd Day: Tehran- Full day city tour of Tehran. 3rd Day: Tehran –Qazvin- Alamut. 5th Day: Masooleh- Bandar-e Anzali. 6th Day: Bandar-e Anzali- Ardabil. 8th Day: Sarein – Kaleybar. 9th Day: Kaleybar – Julfa. 12th Day: Tabriz- Zanjan- Sultanieh. 13th Day: Zanjan – Hamadan. Drive to Hamadan en route visit one of the unique phenomena in the world, Ali sadr Cave, which is one of the biggest water caves. O/N Hamadan. Dive to shiraz from Esfahan en route visiting Naghsh-e-Rostam, the Achaemenian royal necropolis and Pasargadae to visit the tomb of Cyrus the great.O/N Shiraz. This morning we leave Shiraz for Yazd and will visit en route the most magnificent city of the ancient world, Persepolis, which is registered as a UNESCO world heritage site.Persepolis was the ceremonial capital of the Persian Empire during Achemaenian era. where we find the tomb of Darius the great and remains of Achaemenian palaces and edifices.Continue the tour to Abarkuh, visit 4000 old Cypress tree, drive to Yazd, O/N Yazd. Full day city tour visiting Alexender prison, Lareyah house, 12 Imam Tomb, old city streets, Jame mosque, Sayed Roknadin, Water Museum, Amirchamaq complex, Hamam-e-khan old Bazar Fire Temple, Tower of Silence O/N Yazd. Half day city tour including Jame Mosque and Vank cathedral Church. Drive for Abyaneh there you will visit the UNESCO recognized village of Abyaneh, located at the foot of Mount Karkas and in the vicinity of desert. Appreciate the serenity of this quaint village with its splendid archaeology and meet the dwellers who speak, live and dress in the original Persian style, Drive to Kashan. O/N Kashan. Morning, transfer to airport & fly to Kerman. Full day city tour visiting The Ganj Ali Khan complex including Bath & Bazaar as well as the visit Jame Mosque. O/N Kerman. In the morning after breakfast drive to Mahan, there we visit Mausoleum of Shah Nematollah-e-Valli and the lovely Shahzadeh (Prince) Garden in Mahan. O/N Mahan. In the morning after breakfast drive to Rayen visit Rayen, continue our tour to kalut, observe the senset in kalut and stay over night in Kalut Camping site. We drive toward Shiraz from Kalut en route visit a Sasanian Palace(5th AD) in Sarvestan, Jameh Mosque of Neyriz, a short stop near the salt lake to catch a view of its beautiful nature, O/N Shiraz. The city of Nightingales and Flowers, visit Jam-e-Atiq Mosque, Karim Khan Zand Palace, Vakil Complex, (Vakil Mosque, Vakil Hamam, Vakil Bazaar) Pars Museum, Tomb of Hafez and Quran Gate, In the evening visit marvel at mirror decoration of Ali ebne hamze Holy Shrine. O/N Shiraz. Drive toward Yazd en-route visit the most magnificent city of the ancient world, Persepolis, We continue our trip by visiting Naghsh-e-Rostam, the Achaemenian royal necropolis and Pasargadae to visit the tomb of Cyrus the great, and continue to Abarkuh, visit 4000 years old Cypress tree, continue to Yazd, O/N Yazd. Drive from Yazd to Garmeh en route the small village of Bayazeh and visit khanath, from there pass through Aroosan village and then Garmeh, visit the village Garmeh continue to Mesr, O/N Mesr. After breakfast we can do Camel Riding in the desert (Sand dune) then drive to Esfahan en route Nain to visit Jame Mosque. Cultural Museum, Continue to Esfahan there we visit beautiful famous bridges over Zayandeh Rud river, O/N Esfahan. Full day city tour of Imam Square, a jewel of Persian architecture which includes the Ali Qapou Palace, Imam & Sheikh Lutfullah mosques, Chel Sotoon Palace, Handicraft factories and Esfahan bazaar with its traditional arcades, O/N Esfahan. In the morning drive to Kashan visit the Historical houses of Brugerde, Tabatabae, Sultan Ahmed Khan Hamam, Fin Garden. Move from Kashan to Tehran international airport (IKA) for your return flight. (Depends on your Departure time).